We Install and Service All Types of Hydronic Radiant Floor Heating and Snow Melt Systems. Heating experts and those with radiant heating know that when it comes to comfort, indoor air quality, and energy efficiency, radiant floor heating is unmatched in creating the most enjoyable and healthy areas of a home at lower monthly costs. Snow Melt Systems, keep your driveway clean, dry and safe all winter long! COMFORT from Radiant Floor Heating . . . Forget about the dust and allergens which go along with a forced hot air system as well as the temperature swings, set the thermostat to a cooler temperature and feel warmer. The most comfortable heat distribution, warmer at the feet and cooler at the head. Radiant floor heating can be installed on an already finished floor or during new construction and renovations. The most popular places for radiant installations during renovations are bathroom floors and kitchen floors. Using outdoor sensors, the floor temperature will adjust to match the homes heat loss, conserve energy and provide the most comfort by providing an even heat throughout the house. Incorporates more zones allowing for lower temperatures in rooms not being occupied. Operates at lower water temperatures than baseboard, so if you have a high efficiency condensing boiler, you get the highest efficiency possible. Decreases a home’s heat loss by keeping the heat down low and not letting as much escape through the ceiling. Outdoor sensors allow the system to vary the temperature on the floor to only deliver the amount of heat required to heat the space. This will keep you as comfortable as possible while keeping the heat loss and energy usage at a minimum. Reliability - plastic tubing will not rot out like copper tubing can. 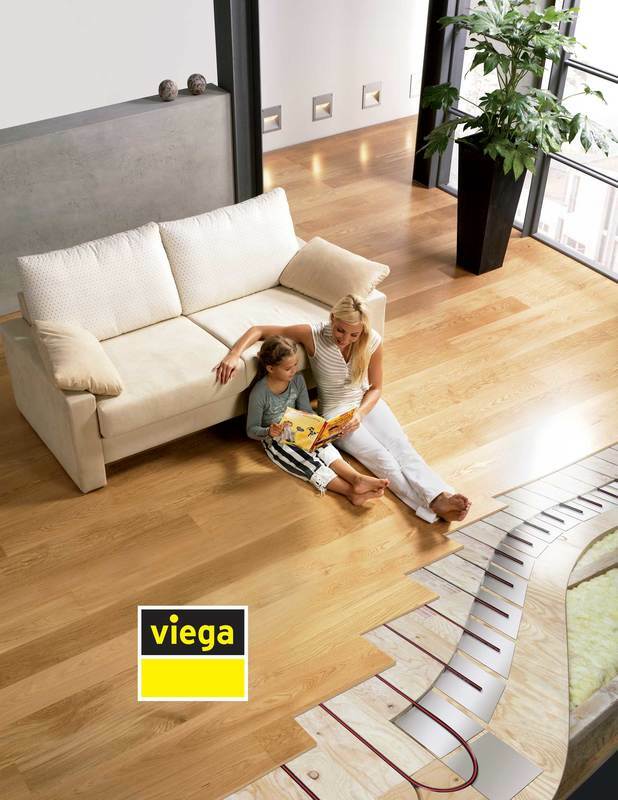 Factory trained by Viega, so your installation will be done right!